A six-wheeled robotic rover named Yutu rode a Long March rocket into space Sunday on China's first lunar landing mission, marking an auspicious start to a four-day journey to the moon. 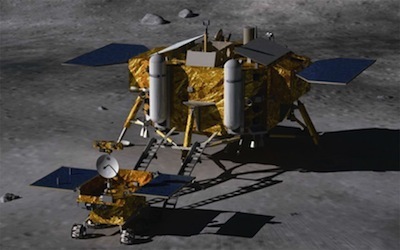 The Yutu rover, mounted on a stationary rocket-powered landing platform, will touch down on the moon Dec. 14. If it makes it, the Chinese mission will be the first spacecraft to achieve a soft landing on the moon since 1976. The lunar landing mission is named Chang'e 3, the third Chinese lunar probe following a pair of orbiters launched in 2007 and 2010. Packed with a ground-piercing radar, cameras, spectrometers and plutonium-powered heaters, the rover lifted off at 1730 GMT (12:30 p.m. EST) Sunday from the Xichang launching base in southern China's Sichuan province. Launch occurred at 1:30 a.m. Beijing time Monday. 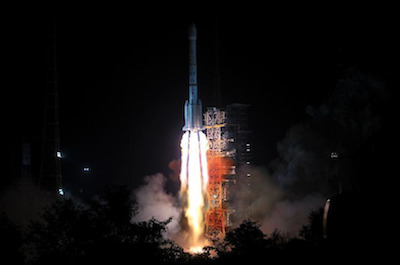 The liftoff was broadcast on Chinese state television. The 185-foot-tall Long March 3B rocket ignited its eight liquid-fueled first stage and booster engines and climbed away from its mountainous launch pad, shedding the liquid-fueled boosters and first stage a few minutes later. A hydrazine-fueled second stage and hydrogen-fueled third stage propelled the Chang'e 3 lander on a direct four-day trajectory to the moon, where it will brake into orbit Dec. 6. The robotic spacecraft separated from the Long March third stage at 1749 GMT (12:49 p.m. EST), drifting away from the rocket in spectacular live video views beamed back to Earth from cameras affixed to the launcher. 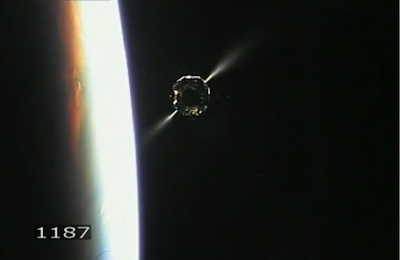 The video showed the Chang'e 3 probe firing rocket thrusters. Plumes of exhaust were illuminated by the sun as the craft flew into sunrise over the Pacific Ocean. The spacecraft deployed its four landing legs and power-generating solar panels a few minutes later, and officials at the Beijing Aerospace Control Center declared the launch a success. "On behalf of the Xichang Satellite Launch Center and the command headquarters, I would like to extend my gratitude to all those who have been part of the project," said Zhang Zhenzhong, director of the Xichang launch base. "And my thanks also go to all the friends who have been helping us throughout the whole process. "The Chang'e probe is on the way to the moon. Of course, it's a symbol of China's national power and prowess," Zhang said in post-launch remarks translated into English on China's state-run television. Over the next few days, Chang'e 3 will adjust its path toward the moon three times to set up for a critical rocket burn to enter lunar orbit Dec. 6. Landing on the moon is scheduled for Dec. 14 in a region known as Bay of Rainbows, or Sinus Iridum, on the upper-left part of the moon as viewed from Earth. Many of the mission's specifications and objectives remained secret until the week of launch, when China rolled out details in a press briefing and through official state-owned media outlets. The lander carries a bipropellant rocket engine designed to adjust its power level and pivot to control the probe's descent from an altitude of 15 kilometers, or about 9 miles, according to China's state-run Xinhua news agency. The probe is equipped with terrain recognition sensors to feed data into the lander's computer, which can autonomously guide the spacecraft to a flat landing zone clear of boulders, craters and steep inclines. That's a first for an unmanned mission, and all robotic landers up to now had to risk settling on to rock fields or other unwelcoming terrain, including NASA's Curiosity rover when it touched down on Mars. The four-legged lander will hit the lunar surface at a speed of less than 8.5 mph, and each leg features a device similar to a shock absorber on a car to cushion the impact, according to a paper published in Science China by members of the mission's development team. Some time after landing, the probe will deploy a ramp for the Yutu rover to drive on to the lunar surface to begin its exploration mission. Chang'e 3 will be China's first mission to test the technologies required for future lunar exploration. China has installed new deep space tracking antennas comparable to the "world standard" and developed advanced autonomous guidance, navigation and control systems for Chang'e 3, according to Wu Zhijian, a spokesperson for China's State Administration of Science, Technology and Industry for National Defence, or SASTIND, which is managing the mission. The European Space Agency is also contributing tracking and communications support to the Chang'e 3 mission. Read more in our preview story.